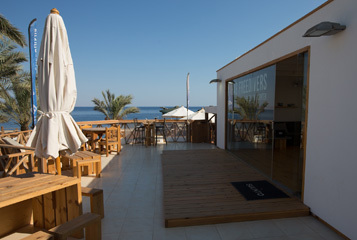 Dahab Freedivers is located within Red Sea Relax Resort in Dahab, South Sinai. 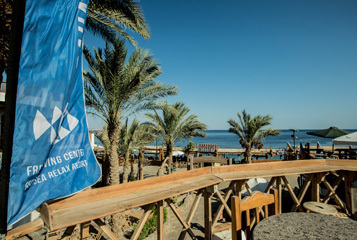 Ideally situated just meters from the beach next to Dahab’s Lighthouse dive site, we are literally seconds from shore-accessible deep water and our confined water training area. 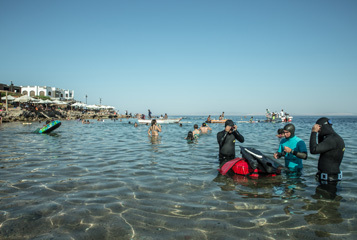 Dahab is a freediver’s paradise with unparalleled access to year-round all-weather training sites including Lighthouse and the world-famous Blue Hole (max. depth 90 mtrs). In Dahab you will also find purpose-built dynamic pool facilities, regular international freediving competitions, an established freediving community and, if you just want to relax and have some fun, wonderful reef replete with colourful marine life. 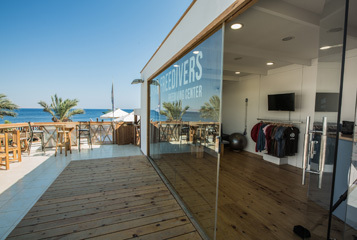 Dahab Freedivers Centre features an AC classroom, wetroom, hot showers, storage facilities, shop and large roof terrace where you can stretch, relax, study or socialise. 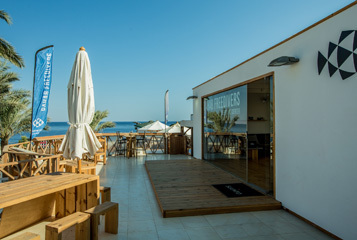 Red Sea Relax Resort is a well-known hotel in the central bay of Dahab, where besides Dahab Freedivers Centre, facilities include a bar, restaurant and roof terrace; pool; gym; beach cafe and beach leisure facilities. 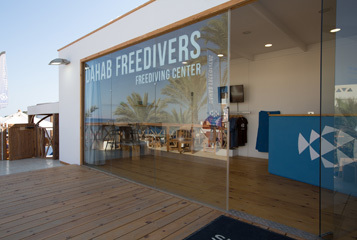 When diving with Dahab Freedivers, you are entitled to discount rates in the hotel. Airport pick-ups are easily arranged and we can have you in a comfortable room about an hour after arriving at Sharm airport. Regular, cheap international flights to Sharm El Sheikh International airport, just 1 hr south of Dahab, give us the perfect location for your freediving get-away. Feel free to come and visit us anytime. We've got the tea ready and we're happy to show you around, share our passion for freediving, and take in the view with you. 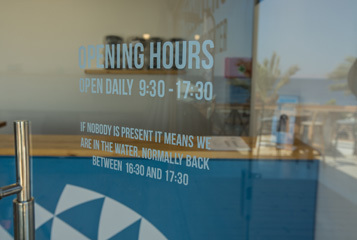 Considering international media attention focussing on current events in the Middle East, we would like to assure our customers and visitors that day-to-day life in Dahab carries on as normal. 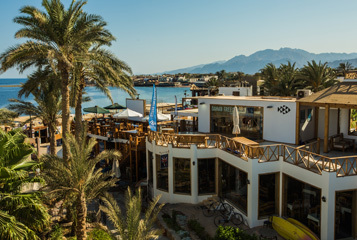 Dahab is a quiet, peaceful town with a hippy vibe and is globally renowned as a watersports destination of excellence. While we understand that first-time visitors may be put off by negative media reports, please note that Dahab and the surrounding area has not been involved in any security issues. If you have any enquiries regarding the current security situation in the tourist haven of South Sinai, please don’t hesitate to ask - we’ll give you honest ‘insider’ updates. Our goal is to provide and teach professional free diving courses to all levels of ability in a fun yet professional and safety-oriented manner, with a view to creating a welcoming community within our facilities where free divers can return to train or learn with friends old and new. Using our expertise, skills and knowledge we aim to make our students aware of the various physiological and psychological processes involved in freediving, with a view to producing freedivers who feel relaxed and safe in the full knowledge of what they are doing, with the awareness that their mental and physical responses are normal. 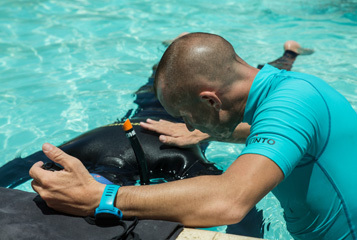 It is our belief that freediving can only be effectively advanced by prioritising safety and instilling a broad awareness of rescue techniques in all our students. 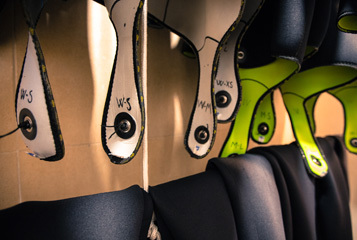 We endeavour to get to know our customers well, to be in a position to evaluate and advise effectively; technique, repetition, a dose of humour and positive energy will be the KEY to overcoming mental barriers. 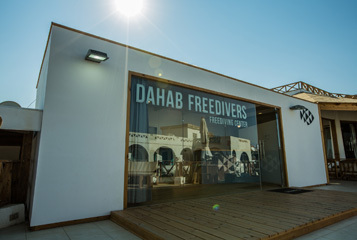 Dahab Freedivers is a Freediving Centre run by three of the world’s most experienced freedivers in competition and training fields. Pascal Berger and Miguel Lozano, well known within the freediving community, are National Record holders in depth disciplines in their respective countries of Switzerland and Spain, with performances close to world status and extensive experience in international competitions. More importantly, with their expert knowledge, fun personalities and outgoing nature, they will guide you in a unique and memorable freediving learning experience. 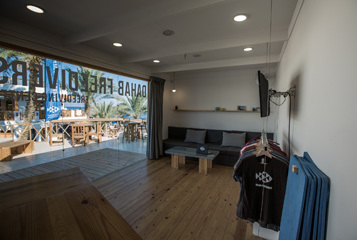 In our centre you will share experiences with beginners, advanced and professional freedivers, and above all friends; we welcome you to enjoy our facilities in a relaxed, fun and comfortable environment. 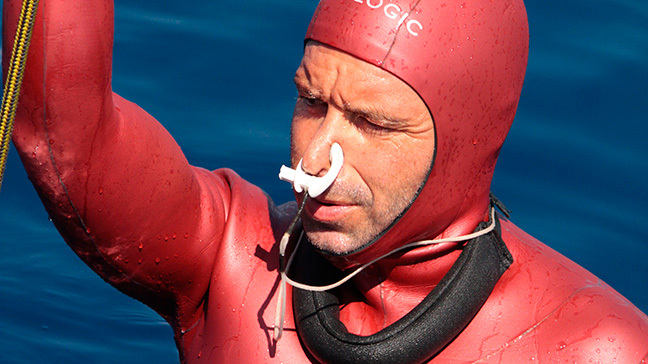 Outgoing, witty, and charismatic, Miguel Lozano is a professional freediver who specialises in depth disciplines. He took silver medals twice in two of the three depth disciplines (Constant No Fins and Free Immersion) in the AIDA World Depth Championships in Cyprus in 2015. In 2016 he performed a 122 metres Free Immersion dive at the Caribean Cup Competition in the Roatán (Honduras), an achievement that today ranks him as the third deepest person in the world in this discipline, just 3 metres short of the current world record (-125m). He was also the first Spaniard to reach a depth of 105m in Constant Weight (CWT) and 83m in Constant No Fins (CNF). He is the current holder of all Spanish depth records and FIM Continental Record. Miguel is an AIDA & SSI & PADI Instructor Trainer and Apnea Academy Instructor. 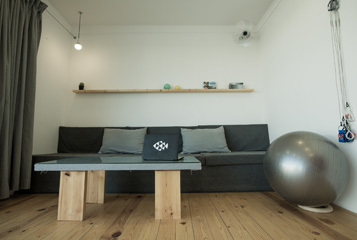 Look out for his training camps and specialized clinics - scheduled throughout the year - which focus on depth disciplines with an emphasis on technique, deep equalization and mental relaxation. Swiss but with Latin blood, Pascal has in recent years burst onto the competitive freediving scene with remarkable results. A highly-qualified furniture and interior designer by profession, and dreamer by vocation, Pascal has left his stable job in Geneva to spend more time training in the depth disciplines. 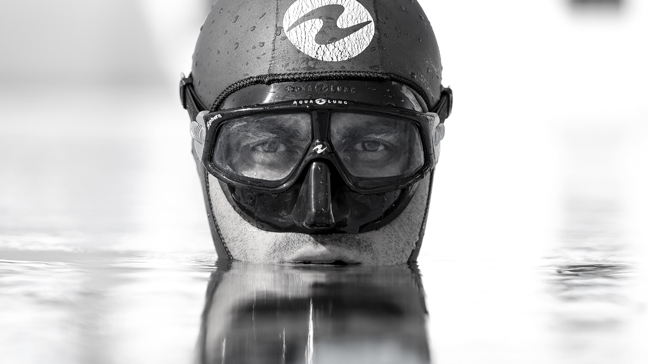 He is the current holder of all the Swiss depth records and has evolved a passionate interest in the development of freediving training and training concepts. He is also the founder and owner of Octopus Lanyards and Noseclips and active in the development and design of new freediving equipment. 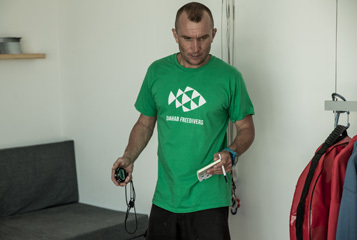 He is an AIDA, SSI & Apnea Academy Freediving Instructor. Lily Crespy grew up in the French Alps but has always been most comfortable in the water. After 7 years of a scientific career in neuroscience research in London, she discovered freediving completely by chance in Thailand in 2012 and fell in love with it instantly. Since then, freediving has become her lifestyle! She is an AIDA and RAID Master instructor, and Apnea Total instructor, and has been teaching in various places around the world. She also competes as part of the French national team, and has some experience as competition safety diver including in the 2018 Vertical Blue. 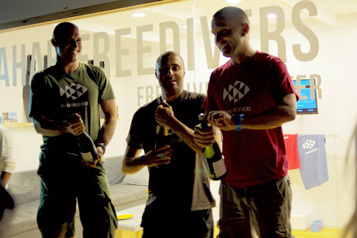 As a good friend of Miguel, Pascal and Stephen Keenan and a regular at Dahab Freedivers for several years where she was training and teaching under Steve's guidance, she decided to accept the manager position in the school after his passing in 2017. Aside from freediving, her other passions are photography, dance and travelling. And sleep and food – lots of it! All our courses include AC classroom theory and practice at Dahab’s Lighthouse and Blue Hole dive sites. Dynamic practice will be in a 25m pool facility in Dahab. For those who have never freedived before and would like to sample the world of freediving, we recommend our 1 day intro. > Requirements: Be at least 18 years old, (or 16 with parent or guardian consent), be able to swim and have no medical contraindications for freediving (provide medical certification). > Requirements: Be at least 18 years old (or 16 with parental or guardian consent) and be able to swim. Medical certification must be completed. 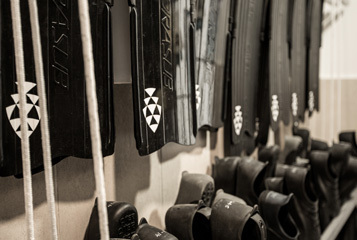 > Includes: Freediving equipment, student’s kit, freediving insurance and AIDA** Certification. > Requirements: Be at least 18 years old (or 16 with parental or guardian consent), be able to swim at least 400m non-stop without fins; have completed Level 1 freediving course and logged at least 15 Freediving sessions (Freediver Log book). Medical certification must be completed. 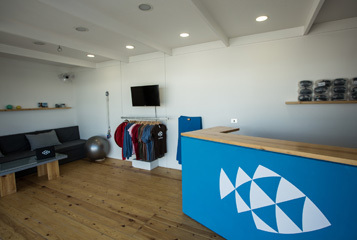 > Includes: Freediving equipment, student’s kit, freediving insurance and AIDA*** Certification. Beginner to advanced in 1 week! Our Combo combines our FREEDIVER and ADVANCED course, with a total length of 6 days, providing the perfect opportunity for students who want to start and immediately get into deeper freediving issues. The integration of these two courses provides solid progression and assimilation of concepts. Advanced to Expert in 1 week! Our Combo combines our ADVANCED and EXPERT courses, with a total length of 8 days, providing the perfect opportunity for students who want to crack on and get into deeper freediving and more advanced skills. 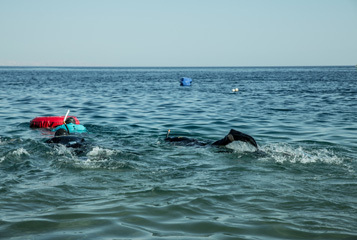 In just one intense week, you could leave Dahab as a knowledgeable and fully independent freediver! > Requirements: Be at least 18 years old (or 16 with parental or guardian consent) and be able to swim at least 400m non-stop without fins. Medical certification must be completed. > Includes: Freediving equipment, student’s kit for the course, freediving insurance for the course andAIDA**** Certification. 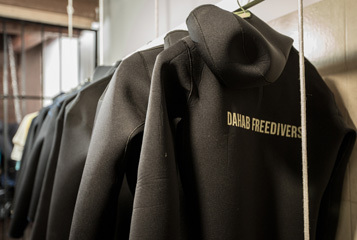 Dahab Freedivers Master is a 4-week immersion into the world of freediving. > Pre-requisites: Certified minimum AIDA3 or equivalent. > Requirements: Be at least 18 years old and be able to swim 400m non-stop without fins. Medical certification must be completed. > Price: €559 for 1 month, equipment included. The Instructor Course is a great opportunity to start your career in freediving and to teach people one of the most beautiful sports in the world. If you want to enjoy each day of your working life - Come and do it with us! > Requirements: Be at least 18 yrs old, have completed AIDA**** freediving course (or equivalent), hold a validated first aid certification. Medical certification/ clearance is required (this can be processed in Dahab), and we recommend taking out professional diver insurance. 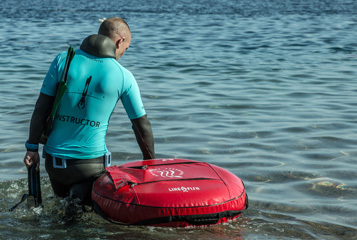 For certified freedivers looking to enhance specific skills, we offer our Speciality courses- a chance to focus on and gain expertise in determined areas. For those who are already certified freedivers (at least Level 1) and are familiar with training techniques, we offer private training sessions. In these sessions we coach freedivers to improve their diving techniques, giving personalised advice on how to identify and solve their diving problems such as deep equalisation, streamlined position, visualisation, mental barriers, etc. > Requirements: Hold a freediving certification, be at least 18 years old (or 16 with parental or guardian consent), and be able to swim. Personalized Coaching program to reach your full freediving potential! > Pre-requisites: Certified freediver (any level, any agency). Note: for AIDA2 freedivers, you will be asked to take the AIDA3 course during your stay (at extra cost). > Requirements: Be at least 18 years old and be able to swim 200m non-stop without fins. Medical certification must be completed. > Price: €650 for 1 month, equipment included. 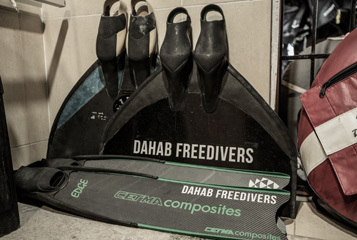 I consent to Dahab Freedivers using my information to contact me about freediving updates and news. Contact us by email, facebook or if in Dahab simply pass by our centre for information. 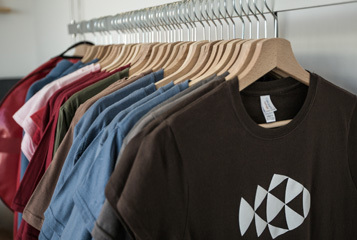 Our business hours are 9 - 6 everyday. Have some tea and enjoy our amazing view while discussing your freediving hopes and dreams.